Honda's Civic Hybrid has proven popular since its debut in the previous generation of the car, back in model year 2003. Increasing interest in hybrids, and the recent fuel price spike, have only added to that popularity. 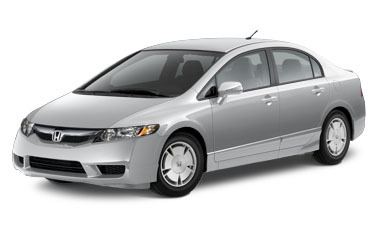 But Honda has not left the Civic Hybrid alone - like its stablemates, it has some new features and improvements for 2009. If the external styling freshening common to all 2009 Civics is not all that readily apparent, newly-available interior options for the Hybrid like leather seating and a navigation system and Bluetooth¨ phone connectivity certainly are. And Vehicle Stability Assist (tm) (VSA¨) electronic stability control is now standard equipment. The Hybrid is a little more upscale, perhaps, and is also a more mainstream choice. The Civic Hybrid's Integrated Motor Assist (IMA) system now works in full-electric mode, in some steady-state driving conditions. It's still simpler, and lighter, than competitive systems. Allied with a 1.3-liter gasoline engine that is the primary power source, the motor-generator, which also acts as the starter motor, usually acts as the electric equivalent of a turbocharger, providing extra power when needed, as when accelerating. It's at its best in low-speed, around-town driving, and the stepless CVT works very well in that environment. As with all hybrids, the Civic Hybrid has the mostly-unsung advantage of regenerative braking - extra stopping power from magnetic drag due to use of the motor as a generator to charge the batter pack during deceleration. The Hybrid Sedan is merely one entry in Honda's extensive Civic lineup. Besides sedans, there are coupes, all in multiple trim levels from inexpensive and economical to high-performance Si. Most Civics use a 1.8-liter, 140-horsepower four-cylinder engine, but the Si gets a 2.0-liter with 197 hp, in coupe or sedan bodies. The Hybrid is not even the only ultra-low emissions Civic, as there is also the natural gas-powered GX sedan, with a version of the 1.8-liter engine modified to run on natural gas, and available with a kit for home fueling. Surprised by Honda's low-emissions awareness? You shouldn't be - the Civic name came from the CVCC (Compound Vortex Controlled Combustion) engine used in the original mid-1970s Civic, which allowed it to meet the emissions standards of the day without add-ons like a thermal reactor or catalytic converter. My week in the Civic Hybrid was pleasant, except possibly in the eyes of the gasoline companies. The example I had was fully-equipped, with leather and the navigation system. At that level, it's no bare-bones "econobox", but rather a comfortable and well-equipped not-so-small (inside) car that just happens to go quite a distance on a gallon of unleaded regular. That distance, according to Honda and the EPA, is 40 miles in the city, 45 on the highway, and 42 overall. The trip computer in my test car said 35, but that was with plenty of foot-to-the-floor acceleration, a necessity on my nearest on-ramp and in traffic around here in general. Hey, I'm a Civic Si type of guy, but the Hybrid provided a better driving experience than other hybrids I've driven, and similar mileage. APPEARANCE: Like the other 2009 Civics, the Hybrid has a new grille and front bumper fascia this year. Differences from last year are not great - the chrome bar across the top grille looks a bit thicker, and the openings in the lower fascia are reshaped. There are also minor changes to the headlights and taillights. Other than that, this year's Civic has the same futuristic, cabin-centric shape that debuted a few years back. Proportionally, the passenger cabin takes up more of the car's length that is usual, and that is further emphasized by the highly-sloped windshield and backlight and short hood and rear deck. The various models are differentiated mostly by wheels and badging. Look for a small "Hybrid" plaque on the Civic Hybrid's trunk lid. COMFORT: The interior space promised by the Civic sedan's large greenhouse is delivered. The large glass area means good visibility, and the small front quarter windows are more than merely a styling element. An interesting split-level instrument panel sets the futuristic-looking but eminently practical tone. Temperature and fuel gauges, and a digital speedometer, all backlit for easy visibility in all lighting, are placed far forward, in the driver's line of sight near the base of the windshield, lessening the need to refocus eyes. The tach and warning lights are in the usual place of honor closer to the driver. Audio, navigation, and climate controls are in the center of the dash, also accessible by the front passenger. My test car had both the leather seating and navigation system packages. The front seats are manually-adjustable, and the driver's seat is even adjustable for cushion height. The rear seat is surprisingly roomy, offering more leg- and head room than is found in some larger cars. A flat floor aids rear passenger comfort, but the battery pack position means that the rear seatback doesn't fold and there is no pass-through. The navigation system has a bright, easy-to-see screen and uses a simple touch-screen interface. All controls are well-marked and intuitive. In addition to AM, FM, and XM radio, a single-disc CD player resides behind the nav screen, a mini-jack and power point are found in a compartment at the bottom of the center stack, and a there is a USB port in the center console. SAFETY: ``Advanced Compatibility Engineering'' (tm) unibody structure improves frontal collision energy management and protects the Civic Hybrid's occupants along with standard front, front side, and side curtain airbags, active front headrests and four-wheel antilock disc brakes. Braking ability is enhanced by regenerative braking, and standard VSA stability control adds further protection. RIDE AND HANDLING: Befitting its nature, the Civic Hybrid's fully-independent MacPherson strut/multilink suspension is tuned moderately, more for comfort than speed. Steering effort is light, but not overly so, thanks to electric assist, and the turning circle is a few inches less than other Civic sedans, possibly because of slightly narrower tires. This helps maneuver into tight parking spaces. Because of the battery pack in the rear, the Hybrid's has more weight on the rear axle than other Civics, taken care of by a slightly larger stabilizer bar. The weight increase from the hybrid system is minor, about 50 pounds over a similarly-equipped EX sedan. Result? The Hybrid still feels like a Honda Civic - sporty if not sports (except for the Si), nimble, and fun to drive. PERFORMANCE:	Honda's IMA hybrid system originally used an electric motor-generator only for extra power when accelerating, never as the sole source of motive power. Further development now allows the Civic Hybrid to operate as an electric vehicle, powered solely by the motor, with the 1.3-liter gasoline engine deactivated, in low-speed, steady-throttle driving. As always, the main contribution to fuel efficiency comes from shutting the engine off when the car is stopped, as at a traffic light, where it would otherwise get zero mpg. Operation is seamless, thanks to the refined engineering behind the IMA system and the CVT (continuously variable) transmission. Engine starts and stops can be hard to discern. The Civic Hybrid is at its best in low- to medium-speed driving, such as around town and on secondary roads. Acceleration is good up to highway speeds, but the relatively low power - 110 horsepower at 6000 rpm and 123 lb-ft of torque between 1000 and 2500 rpm - for its 2900 pound weight means that it can strain when asked to accelerate up a steep highway grade. This is not a serious problem, and the advantage in fuel economy will outweigh the lesser performance for hybrid buyers. CONCLUSIONS: Honda's Civic Hybrid has moved both upscale and more mainstream in its second generation. Engine Size			1.3 liters / 82 cu. in. Wheelbase / Length		106.3 in. / 177.3 in.